The J175G1L Progressive Cavity Pump is ideal for sludge treatment and for pumping both light and coarse sludges and secondary mixed biosolids. The J175G1L’s flow rate is 175 gallons/100 revolutions @ 518 to 788 GPM is coupled to its high temperature resistance of up to 350° degrees Fahrenheit. All replacement pump parts for the J175G1L series dimensionally interchange with other popular manufacturers pump models like the *Moyno® 2000 Series, the *Tarby® Century V Series, and the *Continental CG Series of Progressive Cavity Pumps as aftermarket replacements. Sludge and Biosolids Pumping puts heavy rotational forces on a progressive cavity pump. The J175G1L’s heavy-duty construction allows it to perform in the difficult environments of the wastewater industry and liquid sludge and Biosolids transfer field with its heavy-duty construction. The J175G1L’s low shear and gentle pumping action enables it to pump fluids and not emulsify the liquid making it an ideal mixed-biosolids or a sludge removal and transfer pump with a solids handling capability of up to 50% by weight. 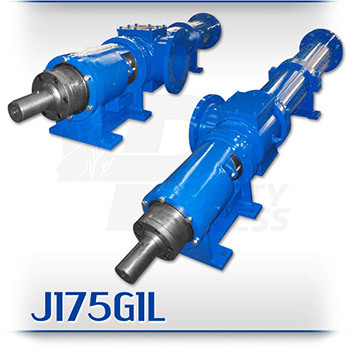 The J175G1L is a standard ANSI flanged pump manufactured with high strength cast Iron or 316 Stainless Steel pump casings and designed in 1, 2 and up to 4 stages for 85, 170, and 350 psi discharge pressures. Standard suction and discharge flange size for the J175G1L is 10″. The pump’s modular design comes with a positively sealed, hardened gear joint assembly, hardened tool steel rotors or stainless steel rotors both with hard chrome plating for long-life pumping and a wide selection of stators in Buna Nitrile, Viton®, EPDM and Natural Rubber. All other wetted parts are either carbon steel or 316 stainless steel. The standard seal design is a set of packing with a Lantern Ring and flush connections. Mechanical seal options are available.